Heat 1 tablespoon butter and olive oil in a large skillet over high heat. Add squash and sprinkle with salt, pepper, and chili powder. Cook for several minutes, turning gently with a spatula, until squash is deep golden brown and tender (but not falling apart.) Remove to a plate and set aside. In the same skillet, melt 1 tablespoon of butter over medium-high heat and add in the kale. Toss it around with tongs and cook it for 3 to 4 minutes. Add in the cooked squash and gently toss together. Set aside. In a separate skillet, melt additional butter and lightly brown both sides of the 8 tortillas. 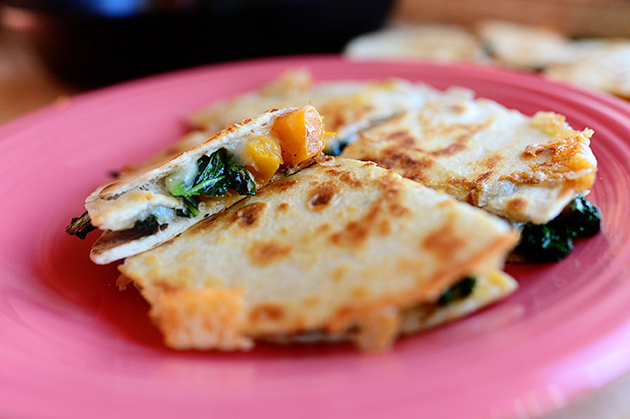 Build the quesadillas one by one by adding a layer of cheese topped with a layer of the squash/kale mixture, topped with a second tortilla. You'll have four quesadillas when you're done. Brown each quesadilla on both sides, adding more butter to the pan to make sure tortillas are nice and golden and yummy. When the cheese is melted, remove each quesadilla from the skillet and cut it into four wedges. Serve with sour cream, cilantro, pico de gallo, salsa, avocado...or any sides you'd like!